Holidays for Sherlock Holmes | Cricket Crazy!!! In Easter holidays, Sherlock Holmes went to Algeria as there was no case going on for him too. There people were fully different. Anybody would rob anybody at any time of the day. At evening Sherlock had bought a new Samsung mobile. While returning home he felt somebody exchange his mobile with somebody. The moment Sherlock thought that someone had kept a bomb in the mobile he exchanged, so he threw it away and heard some explosion type sound. He had a badge of some unknown gang. Thankfully Dr.Watson silently snatched it from his pocket. His name was David Hodge. Sherlock did little surfing on internet about him and took a little information about him and his hiding place. He and his gang were wanted for bombing in America, attacking the Switzerland army, etc. There were photos of their hiding places but they were not found yet. 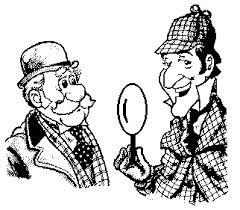 The police had searched in daytime so Sherlock Holmes went at midnight. Fortunately, he saw 5 to 6 members of his gang discussing. Sherlock immediately called the police and arrested them. It was little bit difficult to catch them as they started running. There were 127 members of the gang spread around the world but all were caught as one part of the gang was caught. The border police was very happy with Sherlock Holmes as he helped to catch one of the world’s dangerous gangs. ← Try and try …..